How would you like to wake up to this beauty in the morning? 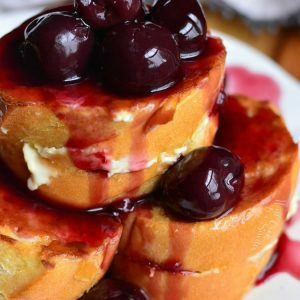 This delicious Cherry Cheesecake Stuffed French Toast is made with soft and chewy French baguette stuffed with sweet cream cheese mixture and topped with brandy dark cherries in sauce. 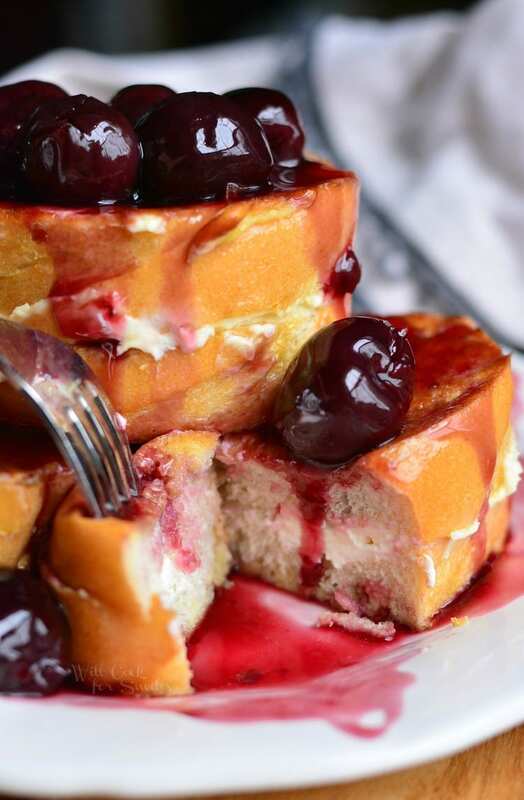 A simple breakfast idea like this stuffed French Toast is so satisfying and can be quite rewarding. I’m talking about the reward of your family gobbling it all up and licking the plates clean. 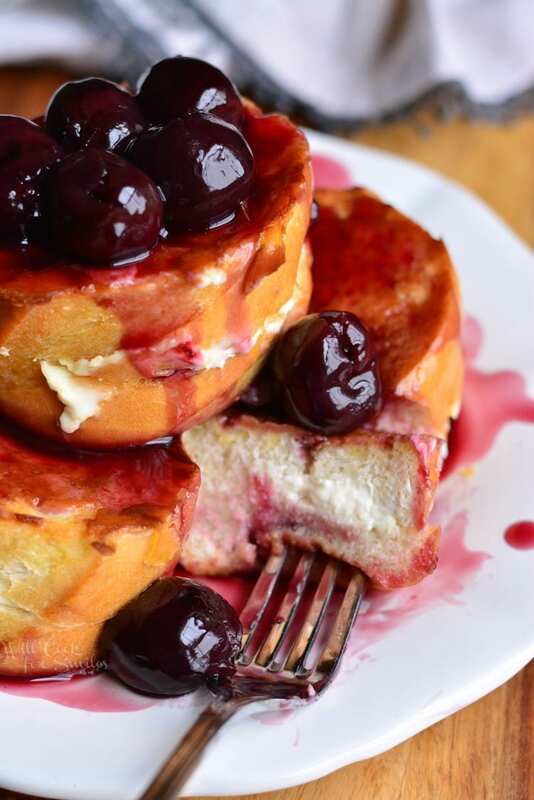 Everyone would be more than happy to wake up to a plate-full of this delicious French Toast breakfast. Valentine’s Day is coming up and it’s one of those few times a year when people take extra time to show their love and appreciation for one another. Some say that “it’s a made up holiday when one is forced to buy gifts and show their love in a special way.” I’ve even heard people say, “why do I have to love my __ on that one day more than any other day? !” And you know what, I COMPLETELY AGREE! I think that we should wake up to breakfast in bed, and roses, and chocolates, and love poems EVERY SINGLE DAY. One day is not enough to show your significant other how much you love them, it should be done every day. If not every day, then at least once a week. And, every weekend after that. 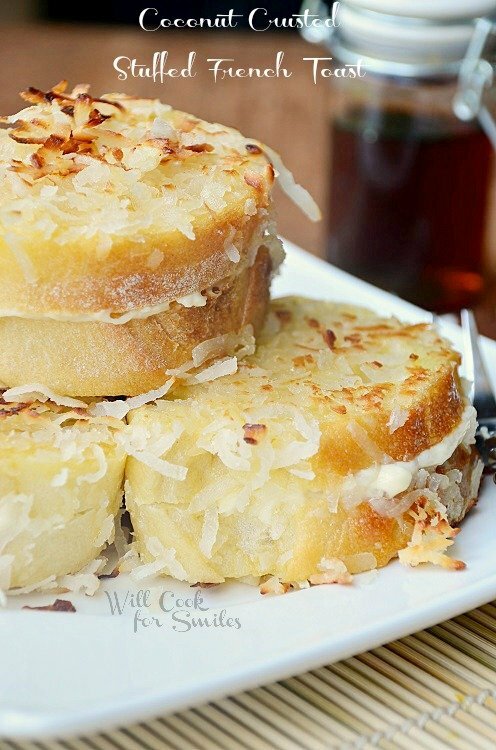 Why stop at the French Toast? 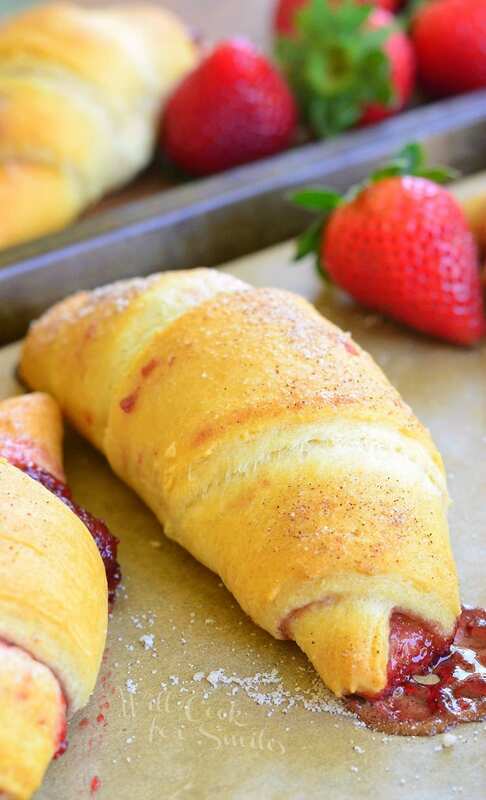 Mix it up by making some Strawberry Lavender Pancakes, Lemon Cheesecake Pastries, or Spinach Artichoke Quiche. 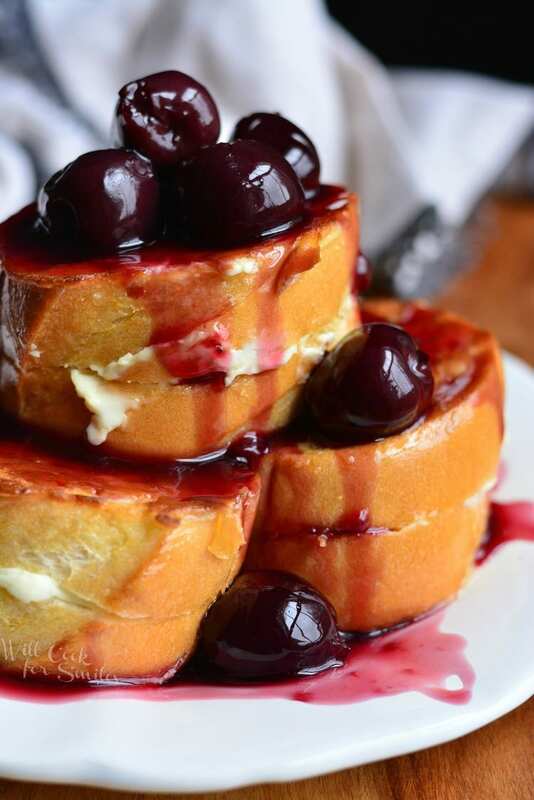 This delicious Cherry Cheesecake Stuffed French Toast is made with soft and chewy French baguette stuffed with sweet cream cheese mixture and topped with brandy dark cherries in sauce. Beat cream cheese, 1 tbsp sugar, heavy whipping cream, and 1 tsp vanilla extract together until smooth. Set aside. In a wide bowl, whisk eggs, whole milk, vanilla extract, and sugar. Whisk until smooth and set aside. Preheat a large cooking pan over medium heat and add some oil for cooking the French Toast. Cut baguette into 1 1/2- inch thick slices. Using a serrated knife, cut each slice in the middle, width-wise. Do not cut all the way through. Spread some cream cheese mixture inside each baguette slice. 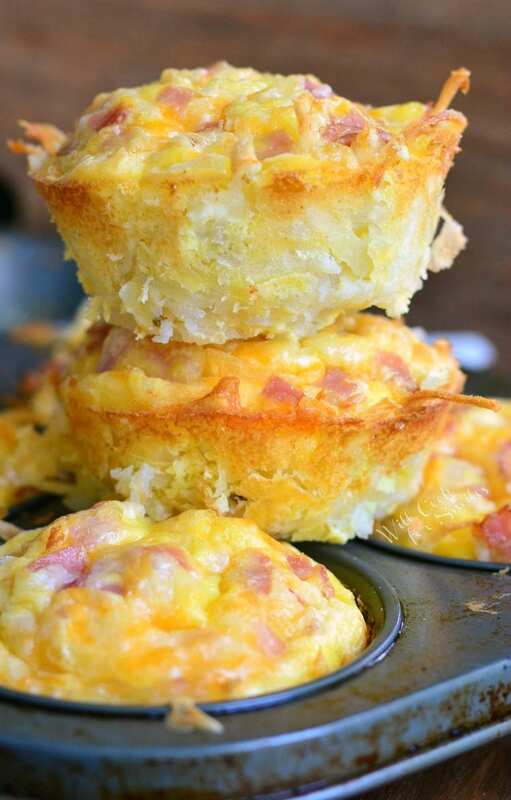 Dip each stuffed slice of bread into the egg mixture, coating it well on both sides. Place each slice into the cooking pan. Cook on both sides until egg is completely cooked and golden-brown. While French Toast slices are cooking, heat up a sauce pot over medium heat. Once the sauce pot is hot, add brandy. Simmer for a couple of minutes and add the cherries and syrup and cinnamon to the pot. Save about a tablespoon of syrup for mixing with corn starch. Stir corn starch and some syrup together until mixed and quickly stir it into the pot. Keep slowly stirring until the mixture is heated through and thickened. Cook for a few more minutes, stirring often. 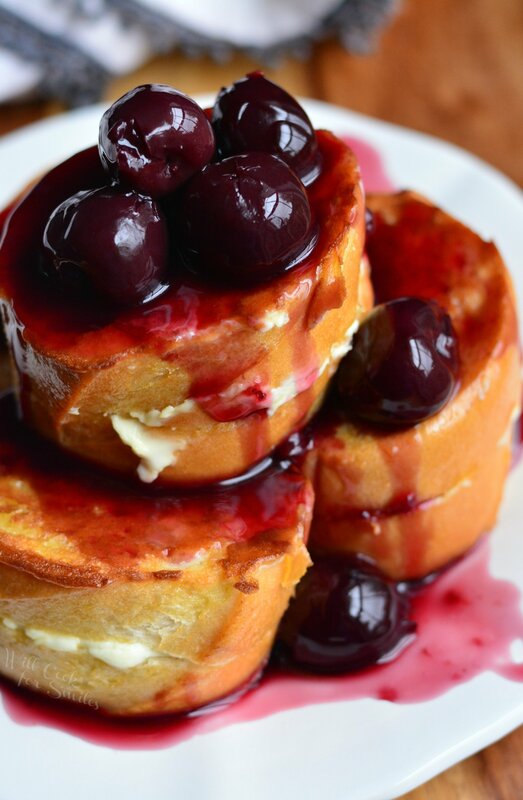 Divide the cooked stuffed French Toast among two plates and generously top it off with cherries and sauce. Note: If you can't find whole dark cherries in syrup, you can use cherry pie filling. Just make sure to omit corn starch when cooking the topping. All that in 25 minutes? Sold! It looks so decadent. Is there another bread substitute you’d possibly recommend other than using baguette that would possibly work as well or close to it?